Nanofinishing of Textile Materials provides thorough coverage of existing, current and future developments in the field. Sections cover a wide range of nanofinishing mechanisms for improving the fundamental properties of textiles, such as bleaching, scouring, softening and surface activation. Other sections discuss high-performance properties and conventional attributes, such as waterproofing, fire-retardancy and novel applications, including conductivity and magnetism. 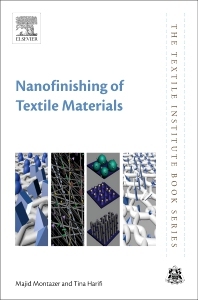 With two highly regarded and experienced authors bringing together the latest information on nanofinishing technology, this book is essential reading for scientific researchers, engineers and R&D professionals working on the development of finishes for improving the properties of textiles. Professor Majid Montazer is director of the nano-bio finishing research laboratory at Amirkabir University of Technology, Iran and part of the Functional Fibrous Structures & Environmental Enhancement (FFSEE) research group. He is also a head of Nanotechnology Research Institute at Amirkabir University of Technology. He was born in 1965 in Tehran, Iran. He obtained BS and MS degrees in Textile Chemistry and Fiber Science from the Textile Engineering Department of Amirkabir University of Technology, Tehran, Iran, and received his PhD degree, in 1996, from the Textile Institute at Leeds University, England. He has coauthored over 200 scientific articles during the last 15 years. He received the title of one of the best nano researchers of years 2011, 2012, 2013, and 2014 from the nano organization of Iran, and the best researcher of the year, in 2010, from Amirkabir University of Technology. He also received a Scopous award in 2014, as an Iranian young scientist, for meritorious contributions in the field of material science. He is collaborating with German part to engage in scientific exchange and cooperation on topics of common interest. He has been awarded for participation in a challenge proposed by Inocrowd (Innovation-based R&D management systems), Portugal. He is currently working on the in situ synthesis of nano particles and nanocomposites on textiles in order to obtain multi-functional properties. He is also interested in medical, industrial, protective and sport textiles and also natural products. Dr. Tina Harifi is a researcher and lab instructor at Textile Department of Amirkabir University of Technology, where she is part of the Functional Fibrous Structures & Environmental Enhancement (FFSEE) research group. She was born in 1984 and received her BS, MS and PhD degrees in Textile Chemistry and Fiber Science from the Textile Engineering Department of Amirkabir University of Technology, Tehran, Iran, in 2007, 2009 and 2014, respectively. Her PhD thesis, under the supervision of Prof. Majid Montazer, concerned the synthesis and stabilization of TiO2:Ag:Fe for multi-functional finishing of polyester fabric and was selected as one of the best researches from Amirkabir University of Technology (Tehran Polytechnic). She has coauthored 28 papers during the last six years and is now a researcher in Nano-Bio Finishing Laboratory of the Textile Engineering Department of Amirkabir University of Technology. In 2017, she received a DFG (German Research Foundation) grant as a visiting scientist for a three-month research stay in Institut für Technische Chemie, Leibniz University, Hannover, Germany. Recently, she has been awarded for co-participation in a challenge proposed by Inocrowd (Innovation-based R&D management systems), Portugal. Her current research interests mainly include synthesis and deposition of nanoparticles on textile substrates for environmental remediation and energy production.